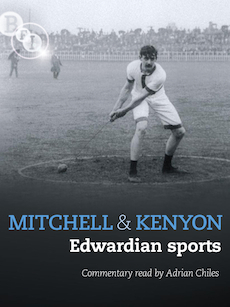 Mitchell & Kenyon: Edwardian Sports offers an unparalleled opportunity to see and learn about sporting action at the turn of the century. A remarkable selection of sporting highlights from the Mitchell & Kenyon collection, it brings together some of the earliest surviving films (1901-7), featuring the titans of professional football, cricket and rugby whilst also rediscovering the Corinthian spirit of amateur sport and leisure in Edwardian life. Liverpool, Hull, Kingston Rovers, Everton, and Blackburn Rovers are all featured, alongside a swimming gala in North Shields, the AAA championships of 1901 and the Mold cricket controversy – an early 'chucking' storm with an Australian umpire at its centre. The DVD is programmed by Dr Vanessa Toulmin of the National Fairground Archive at the University of Sheffield Library, author of the BFI book Electric Edwardians: The Films of Mitchell & Kenyon and editor of The Lost World of Mitchell & Kenyon: Edwardian Britain on Film. The DVD contains an 18-page illustrated booklet with an introduction and film notes by Dr Vanessa Toulmin.